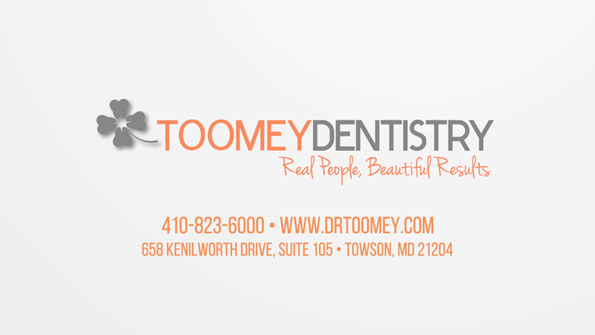 As a dentist serving the Baltimore area, Dr. Toomey and his staff provide cosmetic dentistry, TMJ treatment, and comprehensive family dental care, in a warm and welcoming atmosphere, that just happens to be completely state-of-the-art. Your health and comfort are our greatest priorities. Give us a call, we’d love to see you! Your smile is the first thing people see. A beautiful smile can give immeasurable confidence and make a great first impression. With advanced training in cosmetic dental techniques, Dr. Toomey can offer you many options to achieve the smile you have always wanted. After all, it should be the nicest thing you wear! TMJ stands for TemporoMandibular Joint, also known as your jaw joint. Dr. Toomey has advanced training in TMJ disorders and treatment options. You no longer have to live in pain. We’re here to help you. Toomey Dentistry sees patients from the age of 3 years and up. We are a family practice that focuses on your comfort and health, offering the highest quality and lifelong solutions. Come in, we’d love to see you!